This article is about the historical royal family. For the territorial state over which it ruled, see Ottoman Empire. For current members of the House of Osman, see Osmanoğlu family. The Ottoman Dynasty (Turkish: Osmanlı Hanedanı) was made up of the members of the imperial House of Osman (Ottoman Turkish: خاندان آل عثمان‎ Ḫānedān-ı Āl-ı ʿOsmān), also known as the Ottomans (Turkish: Osmanlılar). According to Ottoman tradition, the family originated from the Kayı tribe[nb 1] branch of the Oghuz Turks, under Osman I in northwestern Anatolia in the district of Bilecik Söğüt. The Ottoman dynasty, named after Osman I, ruled the Ottoman Empire from c. 1299 to 1922. During much of the Empire's history, the sultan was the absolute regent, head of state, and head of government, though much of the power often shifted to other officials such as the Grand Vizier. During the First (1876–78) and Second Constitutional Eras (1908–20) of the late Empire, a shift to constitutional monarchy was enacted, with the Grand Vizier taking on a prime ministerial role as head of government and heading an elected General Assembly. The imperial family was deposed from power and the sultanate was abolished on 1 November 1922 during the Turkish War of Independence. The Republic of Turkey was declared the following year. The living members of the dynasty were initially sent into exile as personae non gratae, though some have been allowed to return and live as private citizens in Turkey. In its current form, the family is known as the Osmanoğlu family. Ottoman Ceremonial Barbering Cape (detail), early 18th century, Turkey. Each day, the Sultan wore a different elaborately embroidered cape for his daily barbering. Public displays of extraordinary splendor were considered essential to the maintenance of Ottoman imperial authority. 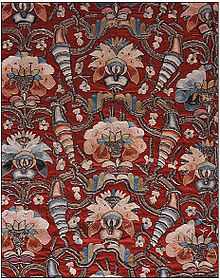 LACMA textile collection. The Ottoman dynasty operated under several basic premises: that the Sultan governed the empire’s entire territory, that every male member of the dynastic family was hypothetically eligible to become Sultan, and that only one person at a time could be the Sultan. Such rules were fairly standard for monarchic empires of the time. The certain processes through which men rose to the Sultanate, however, were very specific to the Ottoman Empire. To go into greater detail about these processes, the history of succession between Sultans can be divided into two eras: the period between the reign of Orhan (1323-1362), the first person to inherit the Ottoman sultanate, and the reign of Ahmed I (1603-1617); and the period following Ahmed I’s reign. The succession process during the first period was dominated by violence and intra-familial conflict, in which the various sons of the deceased Sultan fought until only one remained alive and, thus, inherited the throne. This tradition was known as fratricide in the Ottoman Empire, but may have evolved from tanistry, a similar succession procedure that existed in many Turco-Mongolian dynasties predating the Ottomans. Sons of the Sultan were often given provincial territories to govern until the Sultan’s death, at which point they would each vie for the throne. Each son had to, according to historian H. Erdem Cipa, “demonstrate that his fortune was superior to the fortunes of his rivals,” a demonstration that often took the form of military accomplishment and ruthlessness. This violence was not considered particularly unexpected or unusual. As Cipa has noted, the Ottoman words for “successor” and “conflict” share the same Arabic root, and indeed, all but one of the successions in this roughly 200-year period involved a resolution by combat. Over time, the combat became increasingly prevalent and recognized, especially after a Jannissary uprising negated Murad II’s attempt to abdicate the throne peacefully to his son, Mehmed II, in 1444. During the eventual reign of Mehmed II (1451-1481), fratricide was legalized as an official practice; during the reign of Bayezid II (1481-1512), fratricide between Bayezid II’s sons occurred before Bayezid II himself died; and after the reign of Murad III (1574-1595), successor Mehmed III executed a whopping 19 relatives in order to claim the throne. During the second period, the tradition of fratricide was replaced by a simpler and less violent procedure. Starting with the succession from Ahmed I to Mustafa I in 1617, the Ottoman throne was inherited by the eldest male family member — not necessarily son — of the Sultan, regardless of how many eligible family members were alive. The change in succession procedure was likely instigated by numerous factors, including fratricide’s decline in popularity among Ottoman elites and Ahmed I’s decision not to kill Mustafa when inheriting the throne from Mehmed III in 1603. With the door opened for a change in policy, a political debate arose between those who supported unrestricted Sultan privilege and those who supported a stronger, centralized law system that would supersede even the Sultan’s power to an extent, and historian Baki Tezcan has argued that the latter faction — with the help of influential grand mufti "Sa’deddinzade Es’ad" — was able to prevail in this instance. The blood-free succession from Ahmed I to Mustafa I in 1617 “provided a reference for the eventual stabilization of the rule of Ottoman succession, the very regulation of which by an outside force was in effect a constitutional check on the dynastic prerogative,” Tezcan has written. The precedent set in 1617 stuck, as the eldest living family member successfully inherited the throne in each of the following 21 successions, with relatively few instances of a son inheriting the throne. From the fourteenth through the late sixteenth centuries, the Ottomans practiced open succession – something historian Donald Quataert has described as "survival of the fittest, not eldest, son." During their father's lifetime, all adult sons of the reigning sultan obtained provincial governorships. Accompanied and mentored by their mothers, they would gather supporters while ostensibly following a Ghazi ethos. Upon the death of the reigning sultan, his sons would fight amongst themselves until one emerged triumphant. A Prince's proximity to Constantinople improved his chances of succession, simply because he would hear of his father's death and declare himself Sultan first. A Sultan could thus hint at his preferred successor by giving a favourite son a closer governorship. Bayezid II, for instance, had to fight his brother Cem Sultan in the 1480s for the right to rule. Occasionally, the half-brothers would begin the struggle even before the death of their father. Under Suleiman the Magnificent (1520–1566), strife between his sons Mustafa and Selim caused such internal turmoil that Suleiman ordered the deaths of both Mustafa and another son, Bayezid, leaving Selim the sole heir. During the reigns of Suleiman and Selim II, the Haseki Sultan (Ottoman Turkish: حسکي سلطان) or chief consort rose to greater prominence. Gaining power within the Imperial Harem, the favourite was able to manoeuvre to ensure the succession for one of her sons. This led to a short period of effective primogeniture. However, unlike the earlier period, when the sultan had already defeated his brothers and potential rivals for the throne in battle, these sultans had the problem of many half-brothers who could act as the focus for rival factions. Thus, to prevent attempts at seizing the throne, reigning sultans practiced fratricide upon accession, starting with Murat I in 1362. Both Murad III and his son Mehmed III had their half-brothers murdered. The killing of all the new sultan's brothers and half-brothers (which were usually quite numerous) was traditionally done by manual strangling with a silk cord. As the centuries passed, the ritual killing was gradually replaced by lifetime solitary confinement in the "Golden Cage" or kafes, a room in the harem from where the sultan's brothers could never escape, unless perchance they became heir presumptive. Some had already become mentally unstable by the time they were asked to reign. Mehmed III was the last sultan to have previously held a provincial governorship. Sons now remained within the harem until the death of their father. This not only denied them the ability to form powerful factions capable of usurping their father, but also denied them the opportunity to have children while their father remained alive. Thus, when Mehmet's son came to the throne as Ahmed I, he had no children of his own. Moreover, as a minor, there was no evidence he could have children. This had the potential to create a crisis of succession and led to a gradual end to fratricide. Ahmed had some of his brothers killed, but not Mustafa (later Mustafa I). Similarly, Osman II allowed his half-brothers Murad IV and Ibrahim of the Ottoman Empire to live. This led to a shift in the 17th century from a system of primogeniture to one based on agnatic seniority, in which the eldest male within the dynasty succeeded, also to guarantee adult sultans and prevent both fratricides as well as the sultanate of women. Thus, Mustafa succeeded his brother Ahmed; Suleiman II and Ahmed II succeeded their brother Mehmed IV before being succeeded in turn by Mehmed's son Mustafa II. Agnatic seniority explains why from the 17th century onwards a deceased sultan was rarely succeeded by his own son, but usually by an uncle or brother. It also meant that potential rulers had to wait a long time in the kafes before ascending the throne, hence the old age of certain sultans upon their enthronement. Although attempts were made in the 19th century to replace agnatic seniority with primogeniture, they were unsuccessful, and seniority was retained until the abolition of the sultanate in 1922. The Ottoman Dynasty had unusual succession practices compared to other monarchies. Those succession practices changed over time, and ultimately the sultanate was abolished in 1922. Later, the House of Osman (Turkish: Osmanoğlu Ailesi) continued the latest succession practice for the head of the family. Before Orhan's proclamation of the dynasty, the tribe was known as the Bilecik Söğüt Beylik or Beys but was renamed Osmanlı in honor of Osman. The Ottoman dynasty is known in modern Turkish as Osmanlı Hanedanı, meaning "House of Osman"; in Ottoman Turkish it was known as Hanedan-ı Âl-i Osman, meaning "Dynasty of the Family Osman". The first rulers of the dynasty did not take the title of Sultan, but rather Bey, a title roughly the Turkic equivalent of Lord, which would itself become a gubernatorial title and even a common military or honorific rank. Thus they still formally acknowledged the sovereignty of the Seljuk Empire and its successor, the Seljuk Sultanate of Rûm. The first Ottoman ruler to actually claim the title of Sultan was Murad I, who ruled from 1362 to 1389. The holder of the title Sultan (سلطان in Arabic) was in Arabic-Islamic dynasties originally the power behind the throne of the Caliph in Bagdad and it was later used for various independent Muslim Monarchs. This title was senior to and more prestigious than that of Amir; it was not comparable to the title of Malik 'King', a secular title not yet common among Muslim rulers, or the Persian title of Shah, which was used mostly among Persian or Iranian related rulers. The Ottoman sultans also claimed the title of Caliph starting with Murad I, who transformed the Ottoman state into a transcontinental empire. With the Conquest of Constantinople in 1453, Sultan Mehmed II Fatih (1451 - 1481) claimed the title Kaysar-i-Rûm "Emperor of Rome" and proclaimed himself the protector of the Orthodox Church. He appointed the Patriarch of Constantinople Gennadius Scholarius, whom he protected and whose status he elevated into leader of all the Eastern Orthodox Christians. As Emperor of Rome he laid claim to all Roman territories, which at the time before the Fall of Constantinople, however, extended to little more than the city itself plus some areas in Morea (Peloponnese). Sultan Mehmed II also took the title of Padishah (in Turkish 'Padişah') (پادشاه), a Persian title meaning "Master of Kings" and ranking as "Emperor", claiming superiority among the other kings. His full style was Sultan Mehmed II Khan, Fatih Ghazi 'Abu'l Fath (Victorious Conqueror, Father of Conquest), Padishah, Sovereign of the House of Osman, Emperor of Rome, Grand Sultan of Anatolia and Rumelia, Khan of Khans of the Two Lands and the Two Seas, Emperor of the three Cities of Constantinople, Edirne and Bursa. He was the first Ottoman ruler to adopt the imperial title of Padishah. The Ottoman claim to caliphate was strengthened when they defeated the Mamluks in 1517 and annexed Egypt during the rule of Selim I. Selim also received the title "Custodian of the Two Noble Sanctuaries", Khadim al-Haramayn ash-Sharifayn in Arabic, from Barakat Effendi Grand Sharif of Mecca when conquering Hijaz and with it the Muslim Holy Cities of Mecca and Medina. Selim I full style was: Sovereign of the House of Osman, Khan of Khans of the Two Lands and the Two Seas, Commander of the Faithful and Successor of the Prophet of the Lord of the Universe, Custodian of the Two Noble Sanctuaries, Emperor of the Three Cities of Constantinople, Adrianople and Bursa, Conqueror of the two Armies (i.e. the European and Persian armies). In Europe, all Ottoman Emperors were commonly referred to by the title of Sultan, rather than by those of Padishah or Caliph, which had a higher rank than that of Sultan, and were also often informally referred to by such terms unrelated to the Ottoman protocol as the Grand Turk and the Grand Seigneur or Gran Signore. The sultans further adopted in time many secondary formal titles as well, such as "Sovereign of the House of Osman", "Sultan of Sultans", and "Khan of Khans", these two meaning King of Kings and roughly ranking as "Emperor". These titles were known in Ottoman Turkish respectively as Hünkar-i Khanedan-i Âl-i Osman, Sultan us-Salatin and Khakan (the latter enlarged as Khakan ül-Berreyn vel-Bahreyn by Mehmet II, Bayezid II and Selim I, meaning "Khan of Khans of the Two Lands (Europe and Asia) and the Two Seas (Mediterranean and Indian)". As the empire grew, sultans adopted secondary titles expressing the empire's claim to be the legitimate successor of the absorbed states. Furthermore, they tended to enumerate even regular provinces, not unlike the long lists of -mainly inherited- feudal titles in the full style of many Christian European monarchs. Some early Ottoman Sultans even had to accept the vassal status in the eyes of a foreign overlord. For example, Tamerlane appointed in 1402 the Ottoman Sultan Süleyman Çelebi (deposed in 1411), who was styled as-Sultan ul-Azam, Sayyid us-Saladin ul-Arab wal Ajam, Malik ur-Rikaab ul-Umam, Ghiyas ud-Daula wa ud-Dunya, Sultan ul-Islam wal-Muslimin, as-Sultan ibni us-Sultan, Hasib-i-Nasib-I-Zaman, Amir ul-Rumelia (Grand Sultan, Righteous Lord of Arabs, Helper of the State and the People, Sultan of Islam and the Muslims, Sultan son of Sultans, Prince of Rumelia). Again his brother, Mehmed I, who ended the Ottoman Interregnum, also held his post with a fief from Tamerlane; he took the title Sovereign of the House of Osman, Khan of Khans, Grand Sultan of Anatolia and Rumelia, and of the Cities of Adrianople and Philipopolis. However, the vassalage of the Ottoman Sultanate ended with the death of Tamerlane during the reign of the next Ottoman ruler, Sultan Murad II, who took the style Sultan ul-Mujahidin, Sovereign of the House of Osman, Khan of Khans, Grand Sultan of Anatolia and Rumelia, and of the Cities of Adrianople and Philipopolis. After the fall of the Ottoman dynasty as Emperors of the Ottoman State (Padişah-ı Devlet-i Aliyye-i Osmaniyye in Ottoman Turkish), Abdulmejid II (1922) was still proclaimed Caliph with the title Caliph ("Halife", in modern Turkish) by the republican Government of the Grand National Assembly of the city of Ankara on November 19, 1922. However, the Ottoman Caliphate too was abolished soon afterwards, and Abdulmejid II was utterly deposed and expelled from Turkey with the rest of the Ottoman dynasty on 3 March 1924. He officially continued to hold the title of the throne as the Head of the House of Osman ("Osmanlı Hanedanı Reisi", in modern Turkish) until his death. The Ottoman dynasty was expelled from Turkey in 1924 and most members took on the surname Osmanoğlu, meaning "son of Osman." The female members of the dynasty were allowed to return after 1951, and the male members after 1973. Below is a list of people who would have been heirs to the Ottoman throne following the abolition of the sultanate on 1 November 1922. These people have not necessarily made any claim to the throne; for example, Ertuğrul Osman said "Democracy works well in Turkey." Mehmed VI Vahideddin, last Ottoman Sultan (1918–1922) then 36th Head of the House of Osman in exile (1922–1926). Abdulmejid II, last Ottoman Caliph (1922–1924) then 37th Head of the House of Osman following Mehmed VI Vahideddin's death (1926–1944). Ahmed IV Nihad, 38th Head of the House of Osman (1944–1954), grandson of Sultan Murad V.
Osman IV Fuad, 39th Head of the House of Osman (1954–1973), half-brother of Ahmed IV Nihad. Mehmed Abdulaziz II, 40th Head of the House of Osman (1973–1977), grandson of Sultan Abdülaziz I.
Ali I Vâsib, 41st Head of the House of Osman (1977–1983), son of Ahmed IV Nihad. Mehmed Orhan II, 42nd Head of the House of Osman (1983–1994), grandson of Sultan Abdul Hamid II. Ertuğrul II Osman V Osmanoğlu, 43rd Head of the House of Osman (1994–2009), grandson of Sultan Abdul Hamid II. Bayezid III Osman Osmanoğlu, 44th Head of the House of Osman (2009–2017), great-grandson of Sultan Abdulmejid I.
Dündar I Ali II Osman VI Osmanoğlu, 45th Head of the House of Osman (2017–present), great-grandson of Sultan Abdul Hamid II. According to genealogies of the House of Osman, there would hypothetically be 24 princes now in the line of succession after Dündar I Ali II Osman VI, if the sultanate had not been abolished. They are listed as follows; the succession law used is agnatic seniority, with the succession passing to eldest male dynast. A male person born to parents who are not married to each other at the time of birth is not included in the line of succession and passes no rights to their descendants. The subsequent marriage of the parents does not alter this. At the time of accession, the male heir to the throne must be a Muslim. Any Ottoman Prince who has converted from Islam is excluded from the line of succession. Mehmed Selim Orhan (born in Paris on 3 October 1943), was the biological son or the adopted stepson of Prince Mehmed Orhan II and the American/French Actress Marguerite Irma Fournier - deprived since birth of title HIH Şehzade, by a Morganatic marriage, unmarried and without issue. The descendants of Cem Sultan, because they were all Catholics, extinct in male line. ^ A claim which has come under criticism from many historians, who argue either that the Kayı genealogy was fabricated in the fifteenth century, or that there is otherwise insufficient evidence to believe in it. ^ Shaw, Stanford (1976). History of the Ottoman Empire and Modern Turkey. Cambridge University Press. p. 13. ^ Çıpa, H. Erdem. The Making of Selim: Succession, Legitimacy, and Memory in the Early Modern Ottoman World. Bloomington, Indiana: Indiana University Press, 2017. Page 29. ^ Fletcher, Joseph. Turco-Mongolian Monarchic Tradition in the Ottoman Empire. Cambridge, Massachusetts: Harvard University Ukrainian Research Institute, 1979. Pages 236-251. ^ Tezcan, Baki. The Second Ottoman Empire: Political and Social Transformation in the Early Modern World. Cambridge Studies in Islamic Civilization. New York: Cambridge University Press, 2010. Page 46. ^ Çıpa. The Making of Selim. Page 31. ^ Çıpa. The Making of Selim. Page 29. ^ Peirce, Leslie P. The Imperial Harem: Women and Sovereignty in the Ottoman Empire. Studies in Middle Eastern History. New York: Oxford University Press, 1993. Page 21. ^ Tezcan. The Second Ottoman Empire. Page 46. ^ Çıpa. The Making of Selim. Page 30. ^ Tezcan. The Second Ottoman Empire. Page 47. ^ Peirce. The Imperial Harem. Page 102. ^ Tezcan. The Second Ottoman Empire. Page 77. ^ Peirce. The Imperial Harem. Page 22. ^ a b Brookes, Douglas (2008). The concubine, the princess, and the teacher: voices from the Ottoman harem. University of Texas Press. pp. 278, 285. Retrieved 14 April 2011. ^ a b c d e f g h i j k l m n o p q r Opfell, Olga (2001). Royalty who wait: the 21 heads of formerly regnant houses of Europe. McFarland. pp. 146, 151. Retrieved 14 April 2011. ^ a b c d Bernstein, Fred. “Ertugrul Osman, Link to Ottoman Dynasty, Dies at 97”, The New York Times (2009-09-24). ^ a b c Pope, Hugh. "Oldest Ottoman to come home at last", The Independent (1992-07-22). ^ a b "'Osmanoğulları'na insanlık şehadet edecek' Archived 14 March 2012 at the Wayback Machine", Zaman (newspaper) (2009-09-27). ^ a b c d e f g h i j k l m n o p q r s t u v w x y z "Hayatta Olan Şehzadeler". Foundation of the Ottoman Dynasty. Archived from the original on 25 February 2011. Retrieved 15 April 2011. ^ a b c d e f g h i j k l m n o p q r s t u v w x y z "Osmanlı Hanedanı vakıf çatısı altında toplanıyor". Sabah. 13 September 2010. Archived from the original on 25 March 2012. Retrieved 16 April 2011. ^ a b c d e f g h i j k l m n o p q r s t u v w x y z İbrahim Pazan (15 September 2009). "Osmanoğullarının yeni reisi Osman Bayezid Efendi Hazretleri". Netgazete. Retrieved 16 April 2011. ^ a b c d e f g h i j k l m n o Almanach de Gotha (184th ed.). Almanach de Gotha. 2000. pp. 365, 912–915. ^ a b c d e f Burke's Royal Families of the World (2 ed.). Burke's Peerage. 1980. p. 247. ^ a b c d e f g h i j k l m n o p q r s t u v w "Current Living Şehzades". Official Ottoman Family Website. Archived from the original on 25 February 2011. Retrieved 15 April 2011. ^ a b c d e f g h i j k l m n o p q r s t u v w x y z aa ab ac ad ae af ag ah ai aj ak al am an ao ap aq ar as at au av aw ax "Hanedan-bu-günkü-Osmanoglu-ailesii". tarihvemedeniyet.org. Cite error: Invalid <ref> tag; name "tree" defined multiple times with different content (see the help page). ^ "Descendent of Ottoman Dynasty Cengiz Nazım Efendi dies at 76". Daily Sabah. 20 November 2015. Retrieved 27 November 2015. ^ Buyers, Christopher. "The Imperial House of Osman: Genealogy". The Royal Ark. Archived from the original on 15 June 2006. ^ a b c d e f g h i j k l m n o p q r s t u v w x y Buyers, Christopher. "The Imperial House of Osman: Genealogy". The Royal Ark. Archived from the original on 15 June 2006. Wikimedia Commons has media related to Ottoman Dynasty. Peirce, Leslie P. (1993). The Imperial Harem: Women and Sovereignty in the Ottoman Empire. New York: Oxford University Press US. ISBN 9780195086775. OCLC 243767445. Retrieved 19 April 2009. Quataert, Donald (2005). The Ottoman Empire, 1700–1922 (2nd ed.). Cambridge University Press. ISBN 9780521839105. OCLC 59280221. Retrieved 18 April 2009. Karateke, Hakan T. (2005). "Who is the Next Ottoman Sultan? Attempts to Change the Rule of Succession during the Nineteenth Century". In Weismann, Itzchak; Zachs, Fruma (eds.). Ottoman Reform and Muslim Regeneration: Studies in Honour of Butrus Abu-Manneb. London: I. B. Tauris. ISBN 9781850437574. OCLC 60416792. Retrieved 2 May 2009. This page was last edited on 22 April 2019, at 22:22 (UTC).